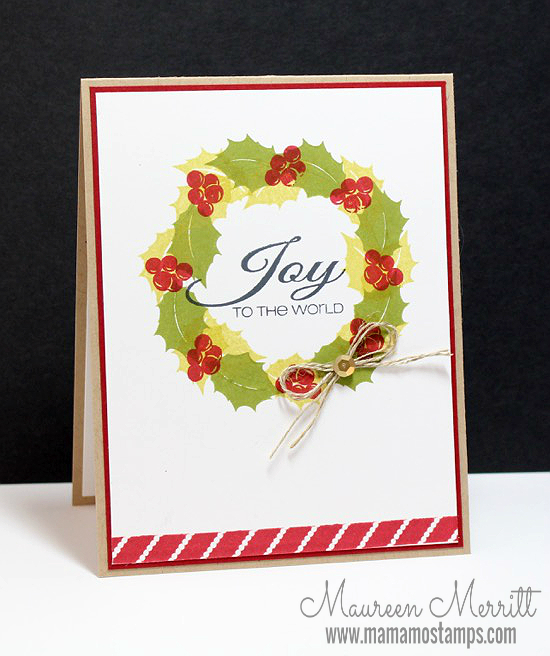 I'm so excited to finally be able to share the cards I have made with the Stamp of Approval Holiday Magic Collection. Have you heard of the Stamp of Approval Collections yet? Well, Catherine Pooler has hand picked a collection of exclusive stamps and dies that is delivered right to your door. You use the contents of the box along with the ink and paper you already have on hand and you can make dozens of projects. You also receive a PDF download that contains many, many card ideas using the collection exclusively! The Holiday Magic Collection goes on sale October 15th at 10AM EDT. The Friendship Collection sold out in one hour & one minute. Catherine did her best to estimate how many she'd need this time around but once they are gone, they are gone! People on the wait list will receive notice as soon as the collection becomes available! Click here to learn more & to get on the wait list! Now on to my card...I used the beautiful Holiday Flourishes stamp set that was designed by Effie from The Ton to make my own holly wreath. I simply traced a circle die and then stamped the holly leaves around the circle, alternating colors as I went. Then I went in and stamped the berries and the sentiment from the Snowy Sayings stamp set designed for the collection by CAS-ual Fridays. Don't forget to erase your pencil line before you put your card together (Don't look too closely at mine!) As a final touch I stamped a border from the Holiday Trimmings stamp set by Winnie & Walter, for just a little extra pop of color! All of the stamps used on this card were from different stamp sets and they all work SO well together. Thanks for stopping by. 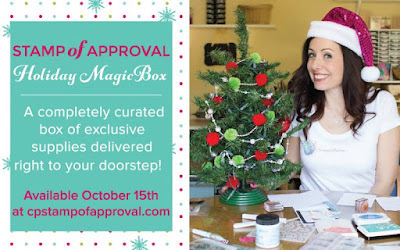 If you'd like to see more projects using the Stamp of Approval Holiday Magic Collection visit Catherine, Jessica, Heather, and Laurel!! The designers started previewing the collection yesterday and will continue through tomorrow. Wednesday is our blog hop and then the release is on Thursday. What a busy and fun week!!! Love Holly. My holly bush has berries this morning. You always amaze me with your stamping Maureen. Such a beautiful, traditional card and I love the pop of red at the bottom. OH OH OH! This is absolutely gorgeous! Definitely going to CASE this! Fantastic! HAHA, I would totally forget to erase the lines too! LOL!!!! Such a festive wreath with more than green as a color of it. Thanks. Really simply, elegant card! What an inspiration. Hi Maureen ~ (Mo?) Your talent never ceases to make me want to create! This card is classicly (is that a word?) classy and I absolutely love it. The addition of the twine and sequin adds a nice touch and the pop of color at the bottom is lovely and brings everything together. Well done. Very pretty card Maureen! I love the holly stamp! Love the combo of gold and green for the leaves. Great card. I always love your CAS cards. Nice job! I love this card. Very elegant. Maureen, this is a wonderful one layer card that is your personal style! I really love how you made the wreath! The different colors actually add a look of dimension and interest. Beautifully done!!! Beautiful care - great job. This card is simple and beautiful, I would love to receive a card like this, for the holiday. Lovely, very ready to get going on Christmas!